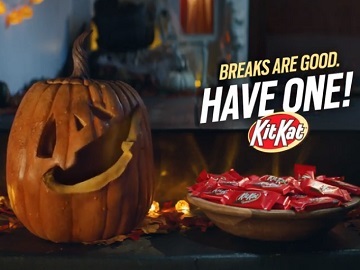 Kit Kat has released its Halloween commercial, reminding people to give themselves a break this Halloween and have a Kit Kat, of course. The 15-second spot features a woman looking at her jack-o’-lantern, which comes to life and scares her by uttering a “Booh!” Hearing her shout fearfully, he bursts into laughter, but he soon stops and his “creator” takes the opportunity to apologize for what she did to his face. He answers he’s good and, handing her a KitKat, advises her to have a break. “Breaks Are Good. Have One!” the carved pumpkin says at the end of the commercial. This new tagline, which replaces the brand’s longtime advertising line “Have a Break, Have a Kit Kat,” created by Donald Gilles, executive at advertising agency JWT London, in 1958, and “Make the most of your break,” released in 2004 as a break from the first slogan, was introduced earlier this year. In a previous spot, the brand of chocolate-covered wafer bar shows two medieval fellows who decide to take a break and have a Kit Kat after struggling to construct a catapult with instructions that only include pictures and no words.